Scytl not only ranked in the Tech Tour Top 50 of Europe´s fastest pre-exit high-tech companies, but was awarded the Special Jury Prize 2015 for compelling and transformative services to business and society. Scytl is the force behind the game changing technology that is helping governments across the globe leverage innovation for improved democracy, citizen empowerment and public transparency, Pere Vallés, CEO of Scytl. 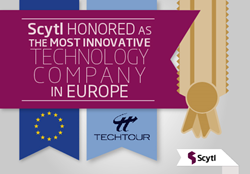 Scytl, the worldwide leader in election modernization, online voting and eGovernance technology received twofold industry recognition: included in the top ranking of The Tech Tour Growth 50, a list of Europe’s fastest growing pre-exit high-tech companies, and in addition received the Special Jury Prize 2015 for its compelling and transformative services to business and society. Pere Valles, CEO of Scytl collected the award on behalf of the company during the Tech Tour Growth Forum networking dinner at the Beau Rivage Hotel in Lausanne. “It is an honor to be recognized as a visionary and driver of the technology that has the potential of positively impacting the lives of citizens worldwide. The elections and governance industry is in the midst of a revolutionary and much needed modernization. Scytl is the force behind the game changing technology that is helping governments across the globe leverage innovation for improved democracy, citizen empowerment and public transparency,” says Pere Vallés, CEO of Scytl. The prestigious Special Jury Prize 2015 was awarded to Mr. Vallés, CEO of Scytl as one of the top European Technology Entrepreneur whose private company has had the biggest impact, on the largest number of people, in the least amount of time. “The Growth Awards are the Tech Tour’s opportunity to celebrate innovative growth companies and is one of the highlights of our year. In 2015, the 9th edition of the awards we are delighted to honor Skyscanner, Shazam and Scytl who are blazing a trail of impressive growth and we wish them even bigger and better things in the years to come,” comments Sven Lingjaerde, founder of the Tech Tour. The Tech Tour Growth Awards have a strong track record in delegating companies that have shown success and long lasting growth in their enterprises. Previous winners of the Growth Award (formally known as the Entrepreneur of the year award) include: Openet, Klarna, Wonga, Betfair, Parallels and Gameforge. Previous Innovation award winners include: Tobii Technology, Enecsys, Soundcloud, Spartoo.com, Meltwater Group and Alfresco. Over the past three months The Tech Tour and Go4Venture Advisers, supported by the International Venture Club (“IVC”), and using data from Dow Jones Venture Source as well as Go4Venture’s own database of large private financing transactions, researched and evaluated European private tech companies, backed by third-party investors, to identify the next generation of European businesses that have the potential to become multi-billion dollar companies – the Tech Tour Growth 50.